Samsung’s new Galaxy S9 and Galaxy S9+ flagship smartphones are two of the most impressive handsets the world has ever seen. They feature a design that is sleek and stunning, albeit not entirely new. They also feature power and performance that outshine even Apple’s latest iPhone models in some tests. Those who follow the industry know that this is the first time in the modern smartphone era that we’ve seen a current-generation Android phone outperform a current-generation iPhone — and not just on paper or in benchmark tests, but in real-world speed tests as well. On top of all that, the Galaxy S9 and S9+ smartphone duo pack new “Super Speed Dual Pixel” camera, which is almost certainly the best camera we’ve seen on any smartphone currently available in the United States. There is plenty to be impressed with when it comes to Samsung’s new Galaxy S9 and Galaxy S9+. Even still, the smartphone duo’s best feature is still the same thing that has made every flagship Samsung phone so great over the past few years. That’s right, we’re talking about the display. That big, bright, positively gorgeous Super AMOLED display. Unfortunately, however, it looks like some Galaxy S9 and S9+ owners are experiencing an aggravating problem with the screens on their smartphones. Anyone who has held a flagship Samsung phone in his or her hand anytime over the past few years will attest to the fact that Samsung’s smartphone displays are the best on the planet. In fact, Samsung makes screens that are so impressive, even Samsung’s frenemy Apple uses screens built by Samsung Display in its latest flagship phone, the iPhone X. That’s right, not even Apple can stay away from the glory that is a Samsung OLED screen. Unfortunately, quality assurance is always an issue in manufacturing and not everyone has the same great experience when it comes to Samsung’s screen. Over the years, we’ve seen several issues pop up — and it looks like a familiar problem is affecting some Galaxy S9 and Galaxy S9+ handsets. People are calling the problem “black crush” this time around, but we’ve seen it happen in the past with a few different phone models. In a nutshell, it’s a color banding issue that prevents the screen from accurately displaying different shades of black. As a result, an image or video with colors that fade from black to dark gray might replace some of the grays with black. On top of that, the dark areas of the image may before grainy or pixelated. The image below from a blog called The Android Soul helps illustrate the problem. 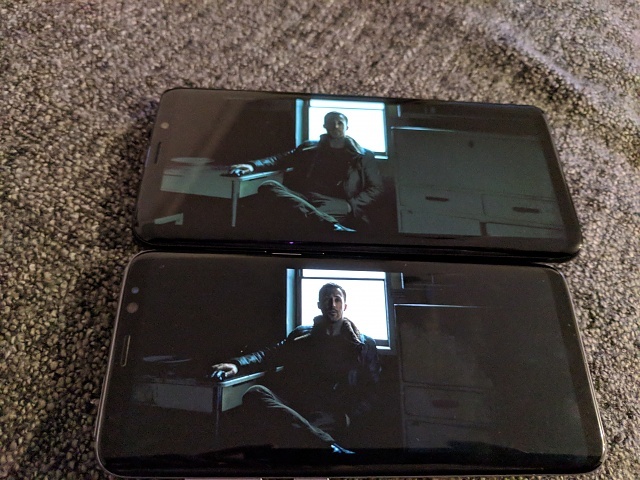 The phone on top shows the sample image properly, while the image on the screen on the bottom phone becomes distorted and pixelated on the right side. Samsung has yet to comment on the issue, but it’s possible that it could be resolved with a future software update. In the meantime, it’s a problem that some Galaxy S9 and Galaxy S9+ users will have to deal with. It’s unclear how many people are impacted at this point, though a growing number of users have taken to forums like xda-developers to report that their phones are affected.